At one time or another we have all fantasised about being royalty, right? Some of us take this too far with a tiara collection but for others making an occasion out of a meal can create that regal feeling, even if just for a few hours. Nothing says pampering quite like an afternoon of lingering over a tower of indulgence – and afternoon tea is a treat for your inner Monarch. “I have the simplest taste – I am always satisfied with the best” quipped Oscar Wilde and I couldn’t help ponder this quote as I sat, wide-eyed taking in my surroundings. Quite simply, there is no setting as steeped in grandeur and magnificence as The Merchant’s Great Room. In the heart of Belfast you are transported to a gilded amphitheatre of opulence, which is nothing short of breath taking. Housed in the former Ulster Bank headquarters dating back to the 1850’s, you are ushered in by a live quartet lulling you with Pachelbel’s Canon in D and climbing the steps to the Great Room feels like leaving reality at the door. Settling in to crimson cushioned throne-like chairs and awaiting a procession of pastries is the dream scenario for ladies (and gentlemen!) of leisure and The Merchant seemed like just the setting for such a ceremony. From an extensive loose tea offering from sultry Lapsang Souchong to rare Japanese Gyokuro Asahi, The Merchant’s Signature Blend, which has been created by Northern Irish gem Suki Tea, stood out as a bespoke option I had to try. Assam and Tanzanian tea leaves mingled with Darjeeling produced a rich, malty flavour profile which was allowed to brew in a beautiful antique teapot fitting of its magnificent surroundings. I should mention that there was in fact a bell on the table, which (no matter how queen-like I was feeling) would never need to be touched due to the level of attentiveness of each staff member, with the pot was refilled numerous times without request. From aged tea-strainers to ‘M’ engraved conserve silver-ware, everything is just so, Finger sandwiches are finger sandwiches, the way they were originally intended – white bread, crustless, dainty. 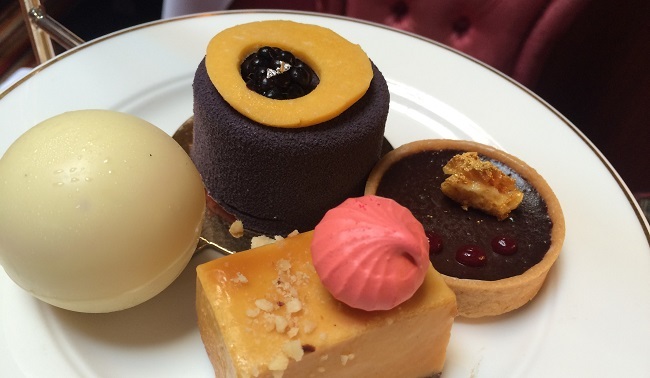 This is high tea fit for a queen. The Queen never wondered where her open sandwich or pulled pork mini bap was. Classic does not necessarily mean creaky. With that in mind, I managed to invoke my inner sensible adult and hold myself back from the temptation to dive straight into the sweet stuff…just. Confit leg is the most wonderfully flavoursome part of the chicken, slow cooked in its own prized fat to luscious tenderness. With traditional watercress, this finger sandwich was easily my favourite of the lot and certainly merited more than the delicate nimble I had planned to have. Call me old fashioned, but it seems I am a traditional lady at heart and I appreciated the lack of mad-cap combination for the sake of novelty and the focus on simple fillings of superior quality in this instance. Baked ham and mooli remoulade was another pleasing combination, mooli being a punchy radish the subtle heat of which plays deliciously with thickly sliced ham. Smoked Salmon and Citrus Butter – classic but never creaky, was simple, elegant and enjoyable. Beef and horseradish, an old Tudor favourite, is less prevalent on these shores, but was a nice nod to classic tradition, as was the egg salad finger sandwich. I’m not a big scone lover, I find they can be too dense, under seasoned and doughy in the wrong hands – my godmother is the benchmark for scones and these perfectly glazed, shiny golden petite bites, which I planned to merely sample were stellar baked goods. When you bake yourself, you are always pleased to see an example of fine craftsmanship and these were just that. Clotted cream, I am not ashamed to admit, is an Anglo enamourment I have long held, and I hate that you only see it on Afternoon Tea menus. There is definitely room for more clotted cream in my life and smothering a butter-rich, crumbly scone with this and tart raspberry preserve came close to converting me to the scone life. On the other hand, I am a macaron fiend. Presented with a giant one, this golden coin-like Gingerbread and Lemon Macaron was so zingy and notably well made. Clearly the shells had been properly aged before serving meaning a crisp exterior gave way to an unyielding chewiness – spot on. As good as Pierre Hermé and I don’t say that lightly. A mini Honey, Blue Cheese and Walnut Tartlet was petite but perfectly formed, enjoyed in one greedy bite. Indisputably, Banana Bread is the best bread of all and The Merchant’s afternoon tea was cinnamon spiced and chocolate studded, enjoyable, but understandably outshone by the Queen’s quadrant of confections sitting like a crown atop the traditional tower, which were by now calling my name so loudly I thought the waiter would have to usher them outside. The time had come. I have to confess, I am not a fan of chocolate transfer sheets and smoke and mirrors patisserie. A work of art which tastes like it has been laced with food colouring isn’t the kind of thing I want to bite into, no matter how pretty it is. I eat with my mouth not my eyes and like to leave art work, of which there is no shortage in the Merchant, on the walls. A Raspberry and Rose White Chocolate Sphere yielded the ever satisfying perfectly tempered crack when struck greedily with a butter knife, revealing a whipped centre of rose mousse with specks of crispy bites. I am not generally a fan of rose (in desserts, feel free to send a dozen or so my way) but this was perfectly pitched, delicate and difficult to resist. 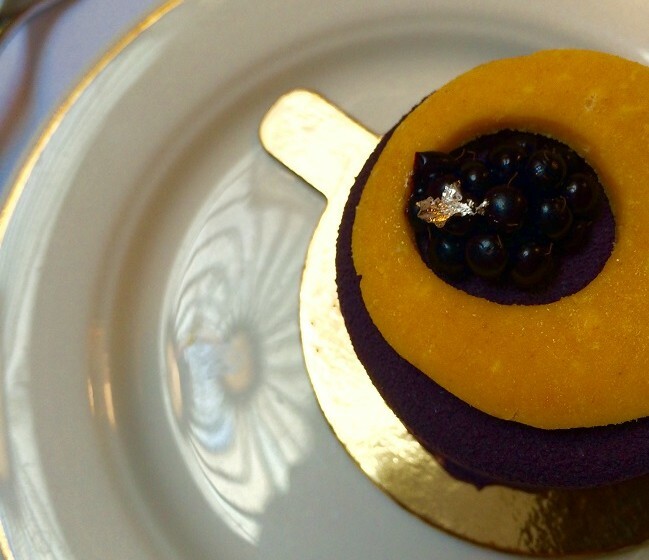 Edible gold was an elegant touch, without a sniff of gaudiness in a gold leaf specked Cremeux of Blackberry and Honey. Feather light cremeux danced on the tongue, with a surprise crumbly pastry centre and tart blackberry lending a natural purple hue. This was a seasonal sensation and beautiful on so many levels beyond the visual. 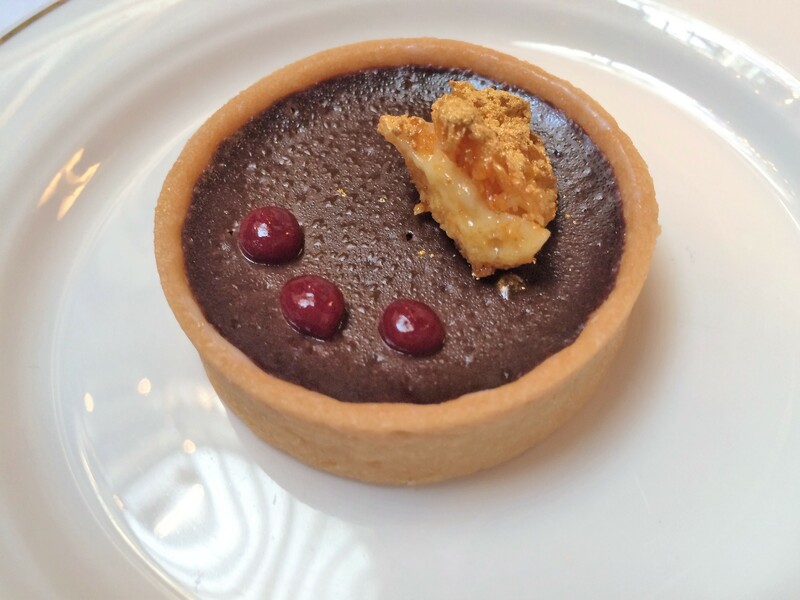 Spiced Pear and Chocolate Tartlet, again tastefully adorned in gold and honeycomb was the perfect autumnal patisserie and unashamedly dark. No soggy bottomed pastry here, just a crumbly paté sucrée framing luxuriant and sublty spiced ganache, contrasted with the welcome sweetness of pear. We so often fall back on the classic strawberry and chocolate combination in confections, but this pear belle hélene inspired tartlet was a delight. Salted Caramel and Chocolate Gateaux, like the Great Room in its title, actually undersold itself! It was the last thing I tried, achingly full and convinced I could barely manage another bite. Crafted with Jivara, Valrhona’s beautiful milk chocolate offering, the salt to sweet ratio was bold, with the former taking the lead. Salted caramel is so often just a trendy buzzword but this had real salinity and edginess against nursery sweet cocoa – perfection. 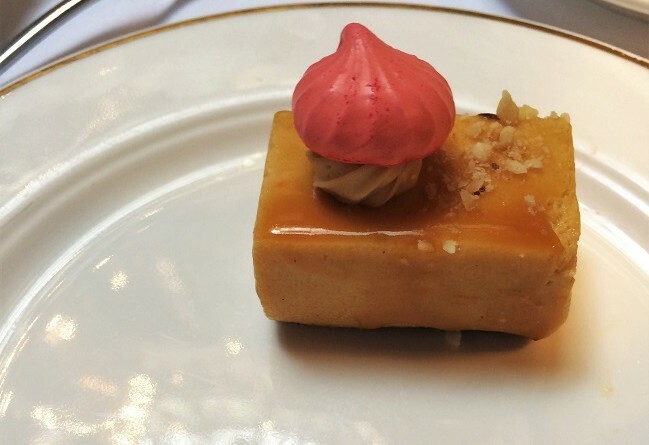 This was a triumph and cemented my conclusion that Pastry Chef Sarah Jamison is a very talented patissiére indeed. The award for dessert of the day was well and truly earned by this beauty and rounded out a selection which contained no weak links. 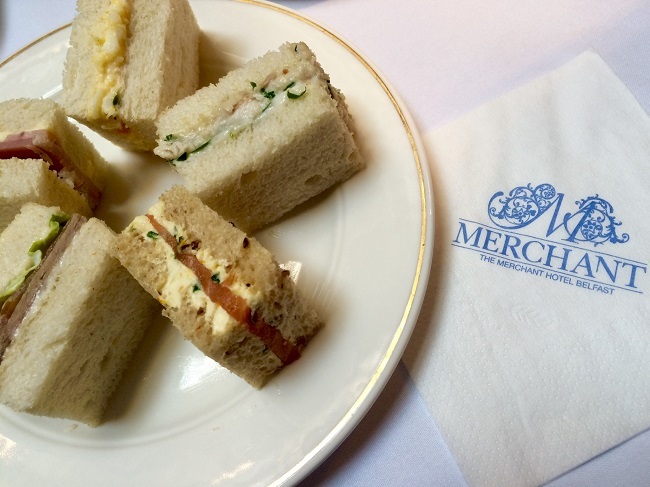 Afternoon Tea at The Merchant is all about timeless elegance and making you feel like royalty for a day. Everything from my surroundings to the most impeccable service ensured I felt like a Queen at all times. The Concierge service, take note fellow dreamers, offers a Rolls Royce hire service. Not surprising, I thought to myself as I drifted back to reality on foot, as The Merchant itself offers the Rolls Royce of Afternoon Tea.